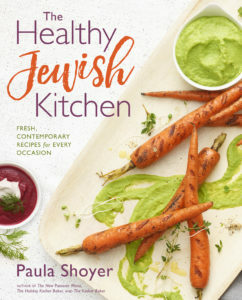 When you think of traditional Jewish cooking, do you think of healthy cooking? I used to love my grandmother’s food that she lovingly and carefully prepared in her small kitchen. Yet all good intentions could not have saved her noodle kugel, brisket and latkes from gobs of unhealthy ingredients like chicken fat, lots of salt and too much sugar. And if you read all the way through to the end of this post, there might just be a Chanukah gift in it for you! 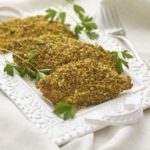 My goal with this recipe was to bake it first, rather than frying it, and then see if I could come up with a gluten-free coating that everyone would love. This schnitzel is great cold after the first day. It should be made after Passover when, if you’re anything like me, you’ll have leftover ground nuts in your pantry. 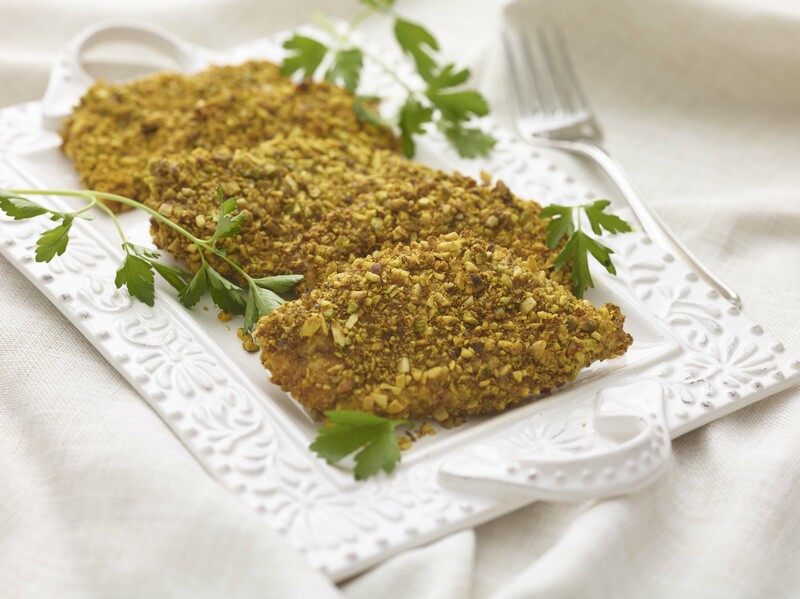 You can also use the same baking method with your favorite schnitzel breadcrumbs. Preheat the oven to 475– 480°F (245– 250°C). Place 1½ tablespoons of oil on each of 2 jelly roll pans and spread to coat. Place the pistachios, almonds, and ground hazelnuts into the bowl of a food processor. Add the turmeric, cumin, paprika, ginger, garlic powder, cayenne, salt, and black pepper. Process until the nuts have been reduced to very small pieces, but not ground into a powder. Place them in a shallow bowl. Crack two of the eggs into a shallow bowl and beat them well. Place the chickpea flour into a gallon-size freezer bag or a shallow bowl (the freezer bag works well). Cut the chicken into as many pieces as you like and, using your fingers, dip each into the chickpea flour to coat it completely, shaking off any excess. Then dip the pieces into the beaten eggs and press them into the nut mixture to completely coat the chicken. Place the chicken on a large plate and set it aside. Wash your hands with warm soapy water. When the oven is preheated, place the oil-coated pans into the oven and heat for 5 minutes. When the jelly roll pans are hot, very carefully remove one pan at a time and add the chicken, leaving a little room between each piece so that they don’t touch each other. Put the pans back in the oven and bake the chicken for 10 minutes. Using tongs, turn over the pieces and bake them for another 5 minutes. Rotate the pans halfway through the cooking time so that each pan has a turn on the bottom rack to ensure maximum crunchiness. If you’d like to win a copy of The Healthy Jewish Kitchen, which offers a new take on Jewish cooking, please leave a comment and tell me what your favorite Jewish dish is; the one that evokes the strongest memories and ties to your faith. A winner will be chosen by random; deadline to enter is this Friday, December 15 at 9:00 PM ET. Good luck, happy cooking and most of all, happy Chanukah! My grandmother’s light as air sponge cake for Pesach. My grandfather would whip the multitude of egg white by hand! It was a joint effort with delicious results. No leavening agents could provide such lightweight results!